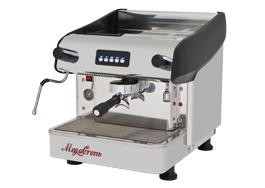 Compact automatic espresso coffee machine with 1 groups, electronic switchboard to control the coffee dosages volumetrically, with automatic water filling and copper boiler with 6 litres capacity with heat exchanger per group. One steam tap (stainless steel) and one hot water tap. See our range of coffee beans too!